Drew Carey mentioned it in his autobiography. KISS mounted their comeback by playing on top of its bar. Jamie Foxx liked to celebrate New Year’s Eve there. Ben Affleck was a regular. Even by the standards of Las Vegas nightspots, the Center Bar at the Hard Rock Hotel & Casino has been a celebrity magnet. Perched under a domed ceiling in the middle of the hotel’s 30,000-square-foot casino, it has long been the place to see and be seen. 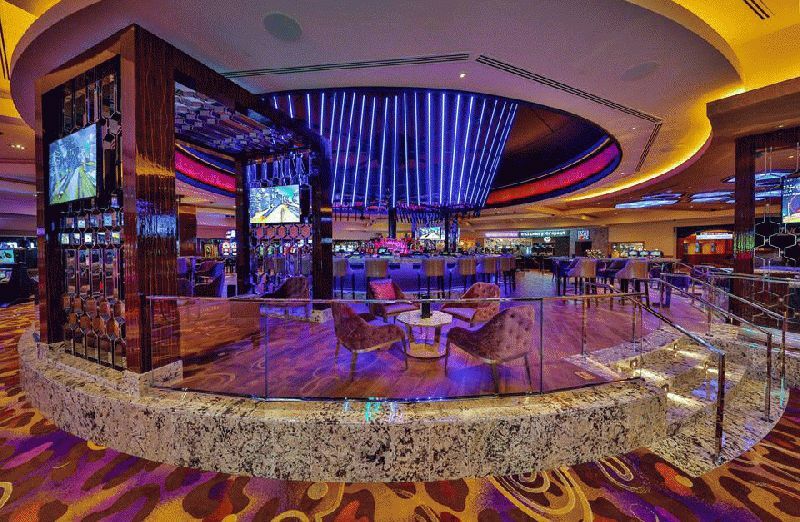 The ultra-bright ÉPIX strips form a circle over the round bar, shining like a crown and riveting eyes from every spot in the casino. For 24 hours a day, seven days a week, the strips display stunning video images that coordinate with the musical performances shown on the room’s video monitors, as well as with architectural lights around the bar. Athey, who’s enjoyed a longstanding relationship with the Hard Rock Hotel and has been involved in numerous projects for the chain, including the design of the iconic video wall at the Las Vegas hotel’s registration desk and Vanity Nightclub, was called in by management to create a revitalizing design for the Center Bar. Lose used Video Dust from Thundering Jacks to manipulate live feed from the room’s music video monitors for display on the ÉPIX strips. The ÉPIX strips display alternating images of custom content cue and Video Dust content cue. There is a two-hour cue list of custom and Video Dust content, which plays throughout the day and night. “Seeing these images on the ÉPIX strips makes it feel like you’re immersed in a concert venue,” said Lose. “As the content designer and programmer, I was given a lot of freedom to display whatever I felt would represent the Hard Rock Hotel best. I generated custom content in Adobe After Effects and programmed with the Chauvet VIP Media Server and ArKaos. The pixel mapped ÉPIX Strip 2.0 fixtures replaced a large globe that had dominated the area over the Center Bar. Although the new abstract design created with the LED strips looks like the perfect fit for this area, installing it was not without challenges.